Central Pacific Coast of Puerto Calderas, near to the town of Puntaneiras. Wives and girlfriends are welcome (25% off regular price). This area is a ridge soaring coastal flight. An opportunity for P1and P2 rated individuals to improve their skills with the beautiful beach ocean under foot. The launch site faces an orientation of 240 degrees (southwest) with a good slope and sufficient clearance to take off even with little wind. Top landings are also possible, and a regular feature. There is space at the launch area for two wings to take off or land at the same time. LANDING - The main landing area is totally visible from the take off. It is large field capable of handling ten pilots landing at once. The field is between the high way and the ocean. Alternative landings areas are widely available; the most common is the beach. Top landings are the norm at this site, unless the wind gets gusty and strong, making a top landing unwelcome. WINDS - In the months of summer (December to April), the presence of cold wind of north (trade winds) restricts the fly on some days. The cycles are usually four days on and four days off. Generally during the winter, which the locals call the rainy season, in the months of May to November it’s possible fly almost every day. Don’t be put off by rain. This is the best time to fly Caldera perfect wind direction. Winds of 8 to 12 miles are a usual feature at Caldera. This gives us great conditions for soaring. Flights of two to four hours are not unusual there. Often they usually fly for an hour or two late morning, brake for lunch at the restaurant, and then go back up for a few more hours in afternoon. WE ALSO HAVE 1 MORE OPTION FOR a THERMAL SITE NEAR BY …. This is the good life of Costa Rica-Pura Vida –Pure Life !!! Trip prices are based on double and triple occupancy. If you do not travel with a friend or partner, you will either have to pay more for a private room or be assigned a roommate . 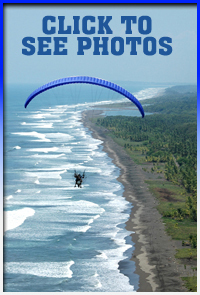 Kite boarding/ Surfing : I will be extending my trip for an additional few days after flying in Puerto Calderas, to Surf and Kite board on the beautiful Costa Rica Coast. Everyone is welcome to join me for an additional cost. Please inquire. EXTRA ACTIVITIES : SURF, HORSE BACK RIDING, RAFTING, WIND SURFING, KITE BOARDING, BUNGEE JUMPING, CLIMBING, DIVING, MOUNTAIN BIKING, HIKING, WANT MORE…? FISHING CHARTS Etc. Per pilot USD $ 800.00 to stay at Tioga hotel. Or USD $600 to stay at a large beach house, Costa Rica style, with lots of space with a full kitchen. Maximum 8 pilots, hurry SPACES FILLING FAST!!! We are accommodating a small group to maximize airtime and reduce waiting time. Comfortable secure accommodations with ac, TV, frig, phone. PILOTS REQUIREMENTS : All pilots are expected to bring a complete set of equipment; back protection, emergency parachute, radio, helmet, and a good pair of boots are MANDATORY. The Fly High Paragliding School is designed for the experienced pilots, intermediate and advanced who is proficient at, or has interest in quality XC flying. Novice pilots are welcome, however must be accompanied by Fly High Paragliding School qualified instructor. The official language in Costa Rica is Spanish but almost everybody can speak English. U.S. Dollar Exchange as of May 9, 2007. U.S. citizens may enter Costa Rica without a tourist visa and can stay up to 90 days. Note: The government of Costa Rica decreed that after November 17, 2003 the practice of accepting U.S. driver licenses/IDs and U.S. birth/naturalization certificates as entry documents is discontinued on a permanent basis. A $20.00 U.S. dollar fine will be charged upon departure from Costa Rica if you overstayed your permitted length in the country.